At the AAPAs, the Bone Clones table was handing out free phalanx keychains, and when I received mine I had to double-check whether it was manual or pedal. 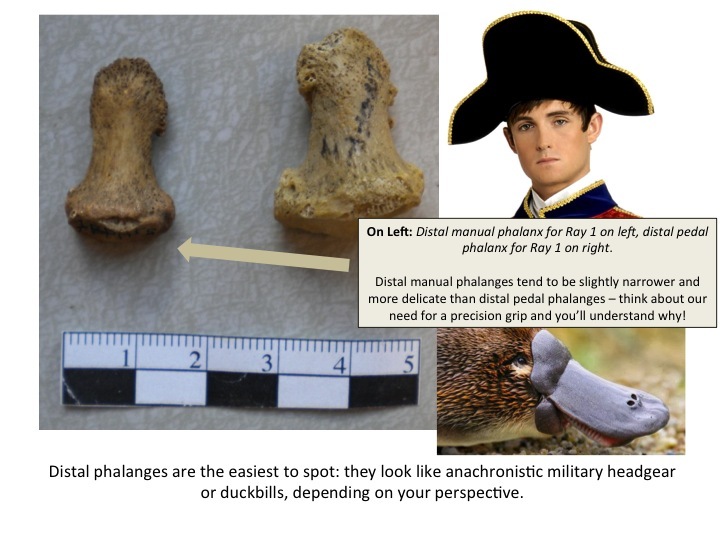 This led me to review White and Folkens’ section on the phalanges, and I realized it would make for a good blog post, since fragmentary and disarticulated phalanges are frequently found at archaeological sites. 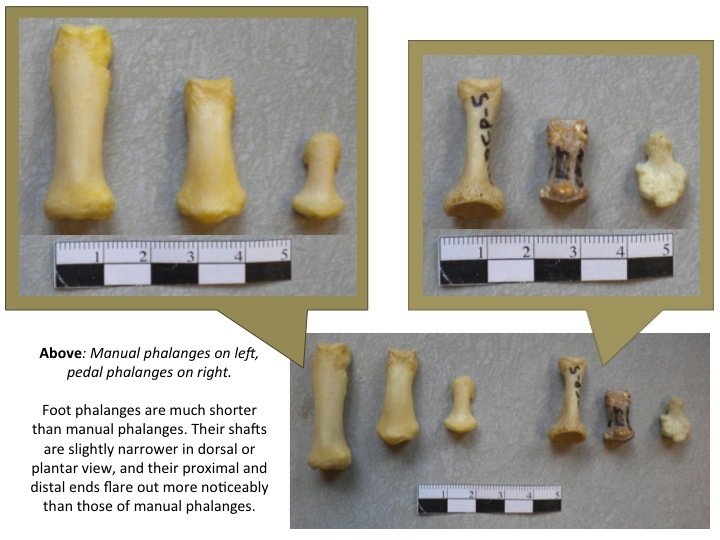 I apologize in advance for the poorly-articulated specimens in the photos, but I wanted to show variability and size and shape between and within each category of phalanges. Manual and pedal phalanges are relatively easy to distinguish from each other, and from the metacarpals and metatarsals, especially if you structure your identification as a series of questions, which is how I’ve outlined the guide below. 1. Is the element a metacarpal, metatarsal, or phalanx? 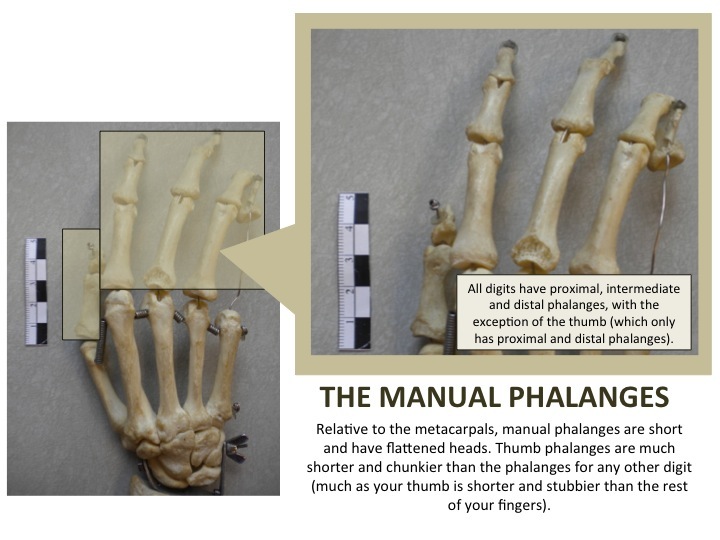 First off, manual phalanges can easily be distinguished from the metacarpals due to differences in size and form. Pay attention to both the proximal articulations, which will be more concave and uniform in the manual phalanges, and the distal articulations, which are flattened in manual phalanges but rounded in the metacarpals. 2. Is it a manual phalanx or a pedal phalanx? Once you know you have a phalanx, rather than a metacarpal or metatarsal, it’s time to figure out whether it’s from the hand or foot. Pay attention to overall length of the shaft, as well as the shape of the element. If it is short, narrow and flares proximally and distally, you’ve likely got a pedal phalanx. If it is longer, has a uniform width and a base and head of approximately the same size, it is more likely a manual phalanx. All of the characteristics outlined above are most useful for distinguishing the proximal and intermediate categories – I’ll address the identification of distal phalanges in Section 3. The shape of the shaft in cross-section is also diagnostic, since the shafts of pedal phalanges are circular, while those of manual phalanges form half-moons. Finally the presence or absence of rugose muscle-attachment sites is also telling, since such markings characterize manual phalanges rather than pedal phalanges. 3. 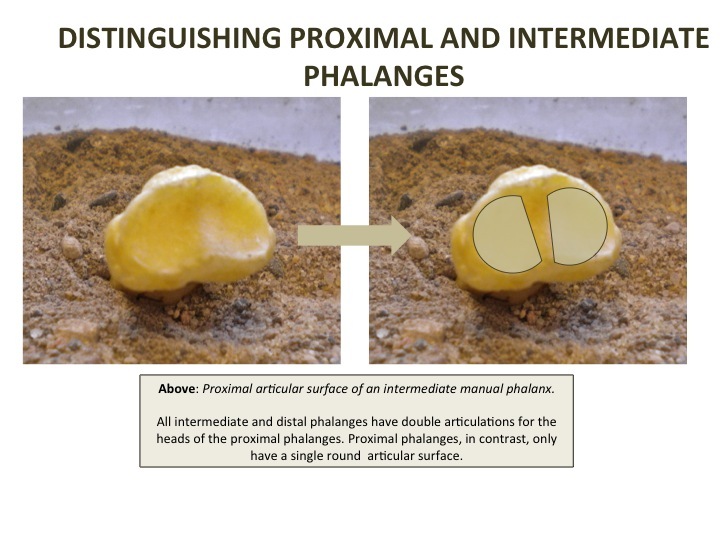 Is it a proximal, intermediate or distal phalanx? Once you’ve decided whether the bone is from the hand or foot, it’s time to figure out whether it is proximal, intermediate, or distal. The key feature to pay attention to is the proximal articular surface. Proximal phalanges have only a single concave articular facet (for the rounded head of the metacarpals or metatarsals), while intermediate and distal phalanges have concave and bilobate distal articulations. Finally, distal phalanges are the smallest phalanges, and have a diagnostic tapering heads that make them unmistakable. 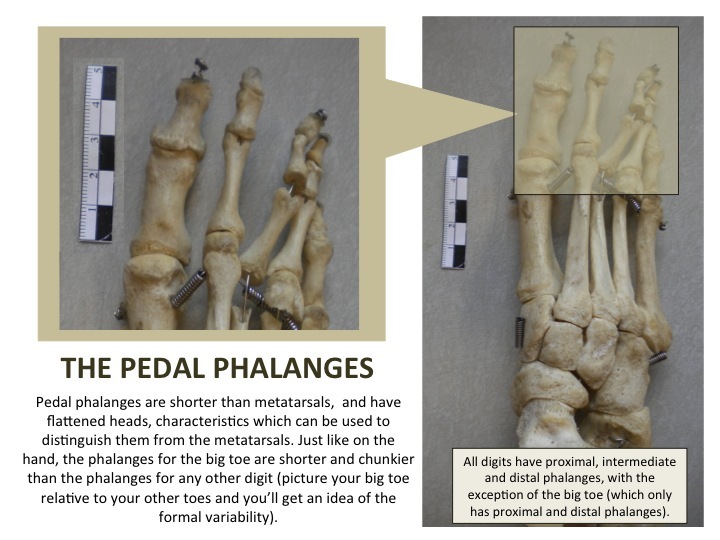 Distal manual phalanges are normally narrower and more delicate looking than distal pedal phalanges – to my mind, distal and intermediate pedal phalanges are the miniature blobfish of human osteology – not the most aesthetically appealing of skeletal elements! If you’re heading out to the field and don’t have a recently acquired Bone Clones manual phalanx key chain, I cannot recommend White and Folkens’ Human Bone Manual enough for its to-scale photographs of hand and foot bones. Their photos provide a valuable means of double-checking your identifications if you have an element missing both proximal and distal ends. 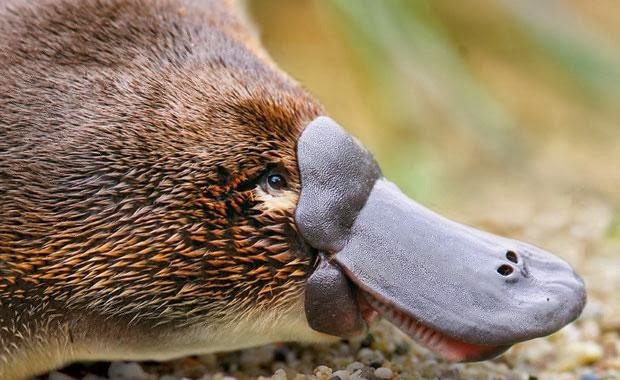 Image Credits: Fanciful old-timey military headgear photograph found here; Platypus found here. All bones photographed are part of the teaching collections housed in the osteology/paleoanthropology lab at the University of Michigan. White, T. D. and P.A. Folkens. (2005) The Human Bone Manual. Elsevier, Amsterdam. 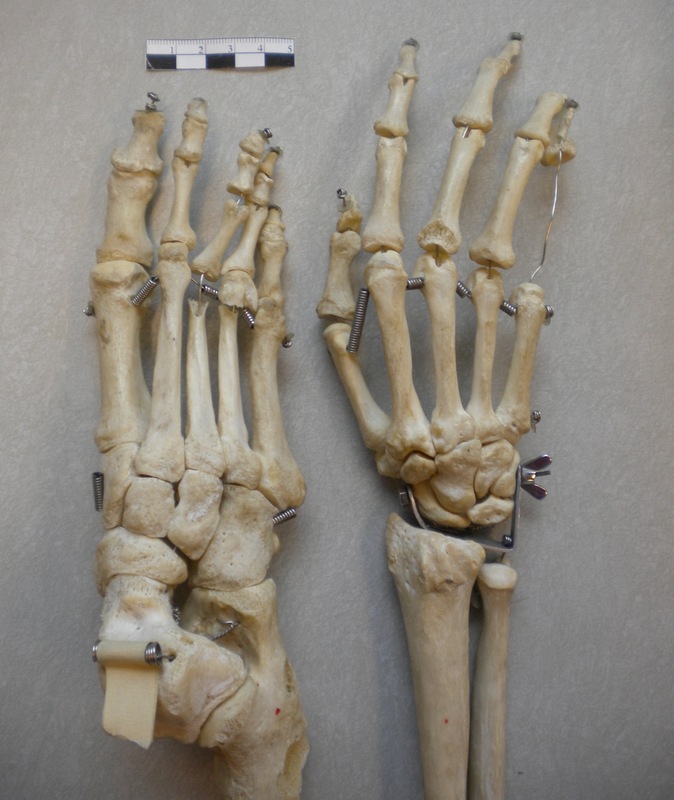 This entry was posted in Foot, Hand, Osteology and tagged Bones, Gross Anatomy, Hand and Foot Bones, Human Osteology, Phalanges. Bookmark the permalink. Came here to say I love the handy little pun in your title. Thank you for sharing this. It helps to better understand my own distal phalanx break – a comminuted fracture. I recently dropped a weight on it at Cross fit, shattering the bone horizontally and vertically, and then while at the podiatrist office waiting for treatment, I fell down the stairs!